This month in the Textile Design Lab we are honored to host guest expert Lital Gold, a textile designer and artist originally from Israel, who moved to Philadelphia in 2011 to work as part of the print-and-color team for Free People and now works from her own studio as a print/CAD designer. You can read more about her in our interview here. Today we hope you enjoy this short excerpt from Lital’s beautiful tutorial on watercolor techniques. 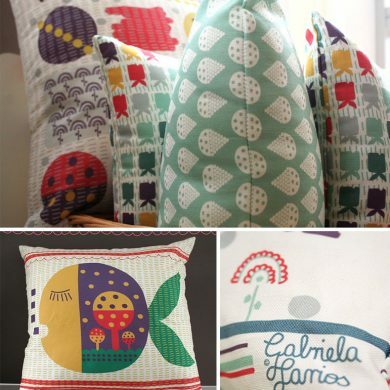 Join us today in the Textile Design Lab to access the rest of this in-depth training! 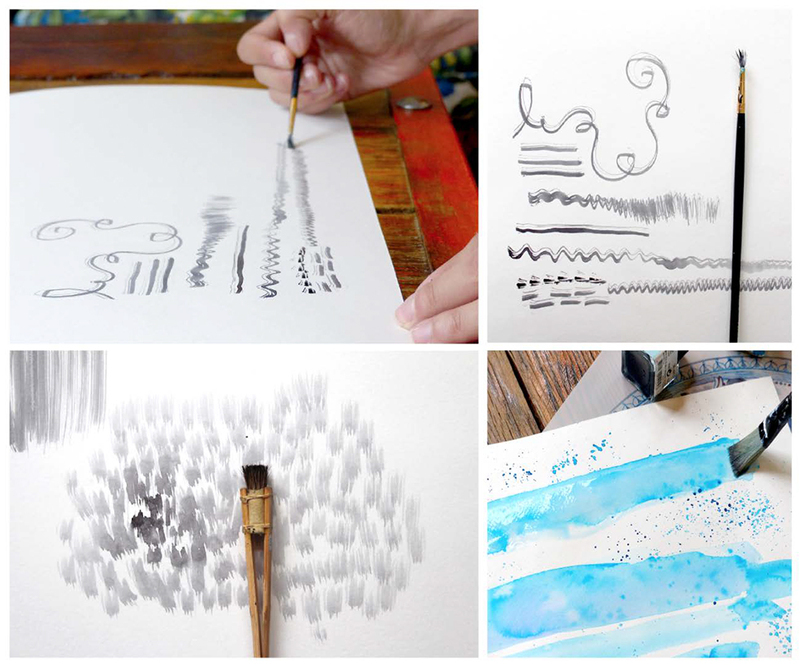 Before you start, take your brush and paint some free lines with it. See what kind of results you can get with it and choose the ones will work the best with your trend. Old and overly used brushes can be great tools for making nice textures. They are also good for “drier” techniques like acrylic. They will give the line a “buzzy” feeling. 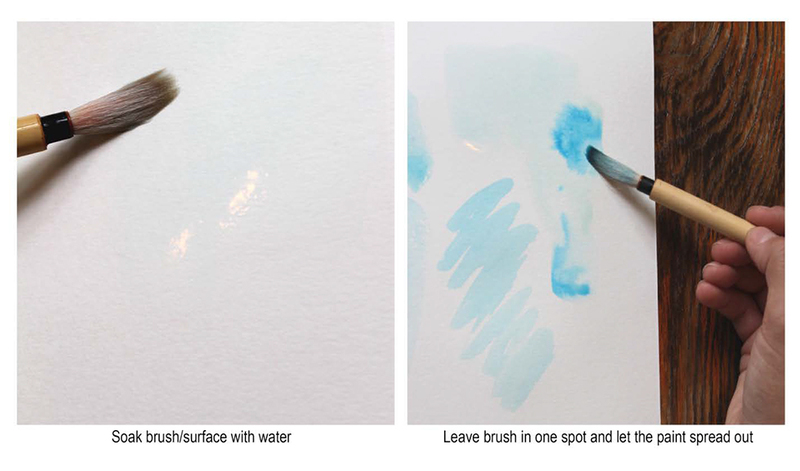 Try brushes that have different shapes for textures and, as always, feel free to be creative. Try textures you don’t usually try. After warming up a little bit, take a quick look at your color palette and make sure you stick to it. It’s true that colors can be adjusted easily in Photoshop, but it’s always good to stay close to the source. Sometimes I’d paint small squares at the corner of my paper with my color tones. You can start with sketching your artwork’s outline with a light pencil (I use B). Make sure not to use the eraser too many times, it ruins the paper. Making an outline is not a must, but it helps with the planning process and with making changes. However, it’s not always necessary, as different artworks can have a freer style to them. 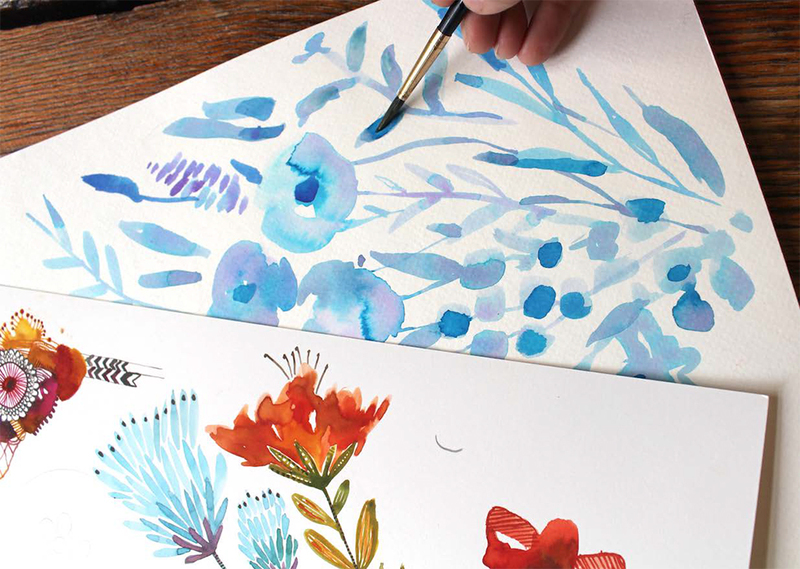 Working with watercolor and inks are nice and simple as long as your working space is clear and relatively organized and you don’t work too fast. Use different amounts of water for every line and learn how to feel when you don’t need anymore water. The most unique thing about watercolor is that the paint spreads, and, if you can control it, the result is amazing. Here’s a simple way of doing it – work with a lot of water and make sure that both your brush AND surface are soaked with clean water. Then, place your brush on one spot and let the paint spread out. You can then work with a little piece of cotton fabric to absorb the water. Pay attention to the way the colors merge into each other. Sometimes you can stop them from merging too much by putting a little piece of paper towel on the area. Don’t forget to switch brushes, as different lines require different thicknesses. Be creative with your process. This working technique has so many different options to offer – you don’t have to use all of them, but be aware of them and know how/when to use them. Most importantly – have fun! In our FREE 5-Day Design Shake Up we’re sharing the exercises and practices we use to stay creative. Even when life is hectic and busy with work, children, errands and all the rest, the creative habits and techniques we’re sharing keep us inspired and creative. We know they will do the same for you! Ready to dive into this FREE 5-day shake up? Get started here.